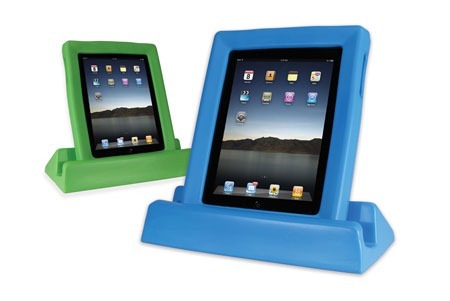 Newly available from Excitim are the Big Grips™ Frame and Stand designed to help protect your iPad® (1st, 2nd and 3rd generation) in a soft, squishy foam frame that is easy to grab and very protective. 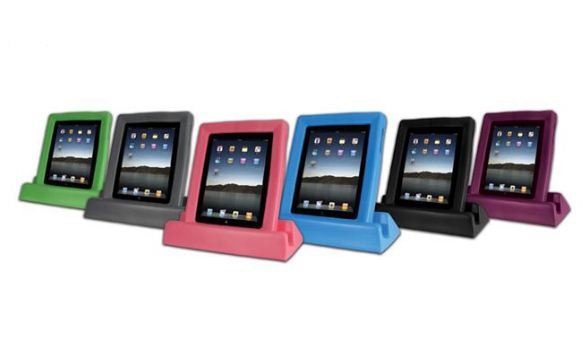 Easy access to ports, switches and an un-obstructed field of view for the camera (iPad 2 and new iPad) Plug in your headphones, adjust the volume and charge your iPad while it is safely stowed in the Big Grips Frame. Watch movies, slideshows, games and all the fun stuff! Park the Big Grips Frame in a matching Big Grips Stand for the best seat in the house. Available separately in six great colours. Choose from blue, green, pink, purple, grey or black. Got a question? Get in touch via our contact page. Geoff Adams-Spink, Age & Disability correspondent at the BBC has been following our co-operation with AbilityNet and has written an article for the BBC web site describing the various switch adapted toys and gaming equipment we produce and available through AbilityNet. You can find his article on the “technology” page of the BBC web site and a radio report on switch adapted toys for the “You and Yours” Radio 4 programme. In collecting the background information for the two reports Geoff met with with David Banes from AbilityNet, Barrie Ellis from OneSwitch.org and visited Willow Dene special school in south-east London. Have a read and listen. Take a look at some of the filming we completed recently. This is the link to the article featured on the Guardian Online website. The video is an extract from the DVD we have just finished that was designed as an aid to help parents, carers, and teachers make more informed assessments of the suitability of our adapted and assistive technology for their children and students. All of the equipment demonstrated can be found on Excitim’s special-needs-toys website.